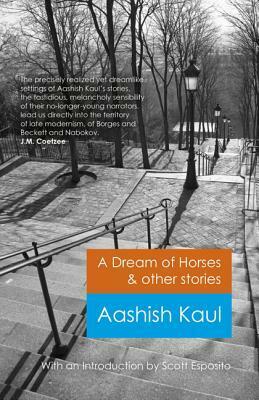 If the author’s medium is words – words strung together to hold a story until it can be read and unleashed by the reader, the reader who ventures into A Dream of Horses & Other Stories by Aashish Kaul is well advised to be prepared to follow those words on the paths they take, the forks they chose to follow, and the dreamscapes they uncover. And, if I advise said reader that they will emerge, in the final tale, on a boat on a lake listening in, no, almost absorbing, an imagined conversation between Jorge Louis Borges and Samuel Beckett, would that offer an indication of the journey in store? It should, but take that as an enticement. This is magical book. A magical book that celebrates the magic of books and traces the joys and heartaches that are bound to the process of translating the imagination into words on the page. This slender collection of seven stories begins with two short tales, a parable about an archer who embarks on what starts out as way to occupy down time between periods of war, and becomes a mystical quest for knowledge; and a fable of sorts about a young child soldier, who wrenched from the opportunity to continue his education, finds himself ready to kill or be killed for the sake of a book. These stories follow a traditional, almost ancient form of storytelling. But from that point on, the influence of the two literary masters whom we will eventually meet on the boat mentioned above begins to infiltrate and inform the narrators, all writers themselves, who will carry us through the remaining tales. In his enthusiastic introduction to this volume, Scott Esposito describes this collection as “seven dreams that Aashish Kaul has persuaded us to take for reality” but, as we discover, even the narrators often have a difficult time separating dream from reality in their own existences, creating a shifting maze, or labyrinth that must be negotiated. In the end the reader (and the narrator) can do little more than surrender to this blurred line between truth and imagination, and the experience of fiction is laid bare as an act of the suspension of disbelief. The longer stories that form the centrepiece of this collection highlight Kaul’s ability to create dreamlike environments – landscapes or cityscapes – that contain and unfold for his characters as needed. The natural settings are typically isolated, atop mountains, amid pine forests or in desolate dry locations. Several stories take place, at least in part, in Paris, a ceaselessly romantic backdrop with bridges, wrought iron railings, gardens and the looming structure of the Eiffel Tour. The former become settings of solitude and refuge from the noise, intensity and heartache of the city. Time functions on different measures in different places, compresses or expands, hanging most heavily over the writer who fears he has lost his voice. In “The Light Ascending”, a writer who is suffering from a creative block, finds himself retracing his steps daily along paths leading from the Institute where he is staying through forests and up hills, seeking answers, inspiration, a clue to the path he should follow. The one book he has published to date had the primary benefit of connecting him with the famed, but elusive writer “JC”. One night, drawn into the woods by the sound of a flute playing he will lose his way and discover that he is “in a dream, mine or another’s, I can’t tell.” He will find himself in a cottage engaged in a most unusual game of chess with JC himself – a game in which he is compelled to begin naming the pieces: Borges, Joyce, Faulkner… Beckett. As his blockage lifts, he is overwhelmed by the enormity of what he has come to realize about his chosen craft. And here he turns, as if abandoning the pen, to address directly the woman whom he met that autumn. In second person, he is able to unfold the story he wants to tell from her perspective. By the end we see why this is the only sensible way to attempt to tell the truth of what lies ahead. “Tahiti” also involves a writer with a woman from his past who has returned to haunt his imagination. As the story opens he has sought respite from city life in an unnamed Asian country where he has come to live in a compound high atop a mountain. Here he discovers a library perched on the edge of a precipice over a deep ravine tended by a nearly blind librarian who knows and recognizes every volume on the shelves. In this environment our writer is able to rekindle an energy for writing through his conversations with the librarian and the books he borrows. Woven against this narrative is the story of his love affair with the enigmatic woman who calls herself Tahiti. As he moves back and forth in his story, the boundaries between reality and dreams – or rather, the realistic and the fantastic – begin to blur, raising the question whether a narrator is in control of the story he tells or subject to lose his own grounding in reality, whatever that is, before the tale is over. For the reader of A Dream of Horses & Other Stories, the lines are so subtly shifted and so evocatively rendered that the sensation, as the last story draws to a close, is one of a renewed appreciation for the power of words and the books that contain them to inform, transform, and entertain. The imagined encounter between Borges and Beckett that rounds off the collection is followed with a brief essay in which Kaul compares the two writers, drawing the parallels that he sees in their work. This concluding piece nicely places into perspective much of the imagery and ideas encountered in the preceding work and brings this book to a satisfying conclusion, leaving the reader free to explore his or her own dreams. Maybe even those dreams that are calling to be put into words. Born in New Dehli, Aashish Kaul presently lives in Sydney, Australia. A Dream of Horses & Other Stories was published in 2014 by Roundfire Books.